Chopard just introduced the newest member to its Imperiale line. The collection was reinvented in 2010 and now the manufacturer succeeds once more in summing up the quintessence of style and elegance in a watch. Synonymous with splendor, power and extreme passions, empires of all eras end every part of the world continue to exercise an inexhaustible and enduring creative influence. After the Coffret de l’Impératrice, launched in September 2015 and celebrating Byzance and the magic of the East, Chopard now draws inspiration for its latest creation from South America and the heart of the Inca civilization. This secret watch combines the best of Jewellery and Fine Watchmaking. 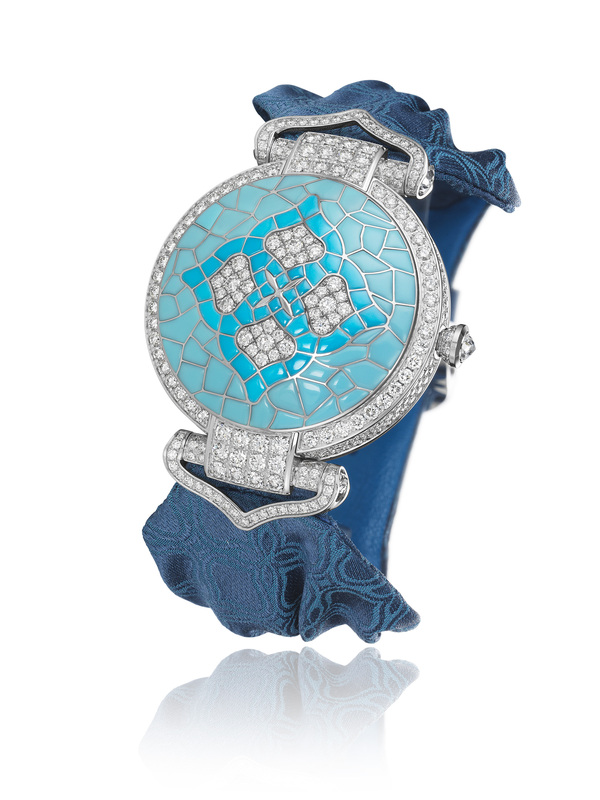 Chopard designed a watch that is as much a magnificent bracelet as a precious timepiece. Like a mosaic from the pre-Colombian era, the dial cover is entirely set with brilliant-cut diamonds and turquoises in subtly varied shades. Its almost hypnotic radiance exudes an aura of mystery and seduction. When the dial opens, the signature symbols of the Imperiale collection appear, those details that endow this jewellery creation with its legendary distinction and strength of character: graceful Roman numerals, tapered hands reminiscent of combat daggers; as well as the famous motif evoking the embroideries adorning the hangings and cushions on which monarchs placed their insignia. 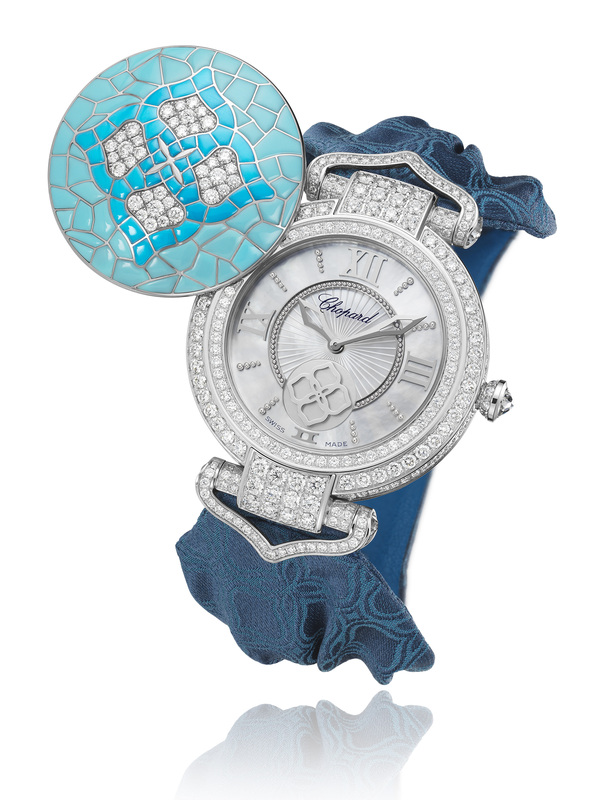 The latter pattern appears on the watch cover mosaic, set with diamonds on the bracelet lugs, as well as lending an original touch to the seconds display; while the dial centre is stamped with a radiant sunburst guilloché decoration in a nod to the Inca dynasty’s fascination for this supreme heavenly body. The case in Fairmined white gold is entirely set with diamonds and houses a veritable treasure: a self-winding L.U.C 96.12-L movement entirely designed, developed and hand-decorated in the Chopard Manufacture workshops in Fleurier. The Imperiale Joaillerie watch is fitted with blue or turquoise damask straps picking up the unmistakable Imperiale motif or with turquoise alligator straps. This entry was posted in womens watch and tagged blue watches, Chopard, diamonds, Haute Joaillerie, womens watch, wristwatch by admin. Bookmark the permalink.